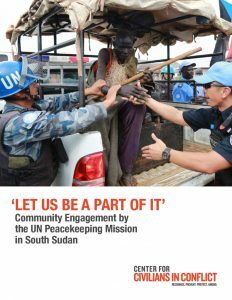 “Let US Be a Part of It”: Community Engagement by the Peacekeeping Mission in South Sudan provides a detailed look at how military, police, and civilian components of the United Nations peacekeeping operation in South Sudan (UNMISS) are engaging communities to understand and address civilian protection concerns. Whether the engagement is by uniformed personnel on patrol or Civil Affairs staff conducting inter-communal and subnational dialogues, these interactions are a vital part of involving civilians in their own protection. The report highlights the importance of UNMISS personnel conducting strategic and coordinated engagement activities and ensuring that information collected from civilians is used to inform operational decisions.